With Verizon, enjoy your independence while feeling safe at home or on the go. SureResponse is a mobile emergency response system that connects users directly to live SureResponse care agents at the press of a button. Get SureResponse for yourself or for loved ones, and enjoy peace of mind 24/7, on America’s most reliable wireless network. $35.00 activation fee. 60 minutes convenience calls included, 45 ¢ per minute overage fees apply. Whether you need assistance for emergencies or simply want to communicate with a caregiver, SureResponse provides immediate access to a SureResponse care agent. SureResponse includes an easy to use wearable device with a one-press call button that lets you place a call to a SureResponse care agent in case of an emergency. SureResponse lets you create a list of people to be notified in case of an emergency. You can also add personal information to your profile so that responders can better assist you. 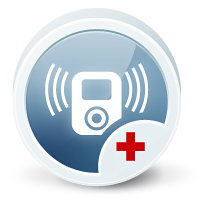 When you use SureResponse, emergency responders have instant access to your location. With your permission, specified caregivers can locate you as well. Charge your device by simply placing it on the docking station. The docking station also includes a 2-hour backup battery in case of power failure. The SureResponse personal device can be worn as on a wrist strap, lanyard, or on a belt clip. It's waterproof and includes one-press calling, a built-in speakerphone, and a 120 hours of standby battery life. SureResponse care agents are available to assist in case of emergency 24 hours a day, 7 days a week. The SureResponse service comes with 60 minutes of Convenience Calling. Care Center agents can find a phone number of interest to you, or connect you to friends and family, restaurants, banks, and more. Use SureResponse Online to add, remove, and update lists of caregivers. Authorized caregivers can locate you, receive alerts about your device, and can call you (calls are connected by a SureResponse care agent). Why have I reached this page? All other actions are prohibited on this account. If you think you have reached this page in error, please contact your supervisor.